And by greener I mean environmentally friendly, I'm not gonna make your period blood green, lolz. Think about how many sanitary products you buy and use each month, for however many days, for 30-40 years, and multiply that by about half the human population - that's a lot of waste! And not only waste but production of sanitary products has a huge environmental impact, especially the production of plastic tampon applicators and pad packets. Cotton tampons sans plastic applicator take a lot less time to bio-degrade - only six months compared to twenty five years! Although cotton farming doesn't use as much energy as producing plastic applicators, it's still not ideal. Menstrual cups are the best environmentally friendly option - from what I've heard. I've never tried one so can't actually vouch for it. If you're not feeling ready to move onto the menstrual cup, organic cotton tampons may be your best bet. Veeda do a small selection of pads and tampons, without any of the usual chemicals other big brands contain. I thought without an applicator, these tampons would be difficult to use, but it really didn't make a difference, and as far as pads go these ones I tried did the job, and were more comfortable (and less rustly) than other brands I've tried. A menstrual cup would be cheaper in the long run - you only need to buy it once! But per packet Veeda are inexpensive, although I think they're more expensive if you buy them in Boots rather than from their website. Which I know because I bought more when I ran out of pads, deciding to switch from Tampax pearl. We can't help our periods! But maybe we should be thinking about the extent of environmental damage we could possibly stop by changing up a few habits, switching tampon brand for example ;-) or using reusable cloth pads, or investing in a menstrual cup. Have you ever thought about the environmental impact your period has each month? Would you consider changing up what products you use? 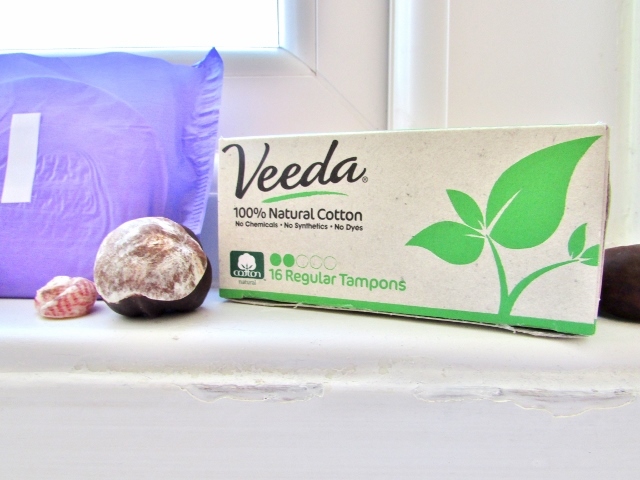 This post was written for VeedaUK and they supplied me with a 16 pack of their regular tampons and cotton regular towels to review. All (too honest) opinions are my own.